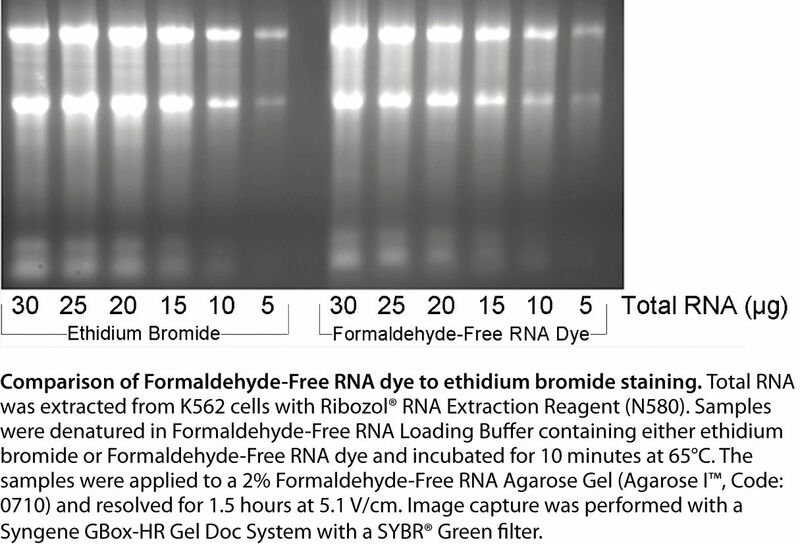 The Rapid formaldehyde-free RNA gel kit is a safer alternative to formaldehyde-containing agarose gels for denaturing electrophoresis of RNA. 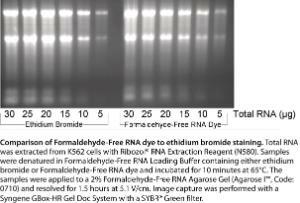 The kit provides a non-volatile substitute for formaldehyde as well as a non-mutagenic RNA stain, which eliminates the need for ethidium bromide staining. The non-volatile denaturing agent included in the gel solution and loading buffer of both kits effectively eliminates RNA secondary structure to ensure optimal resolution during electrophoresis. Gel casting and electrophoresis can be safely performed on the benchtop without a fume hood. In contrast to formaldehyde-free gel kits containing glyoxal, this kit does not require extended incubation steps or buffer recirculation. Lieferumfang: Kit includes Rapid RNA gel running buffer, 10X (2×500 ml), Rapid formaldehyde-free RNA gel solution, 10X (150 ml), and formaldehyde-free RNA gel loading buffer, 2X (3×2 ml). Each kit contains sufficient material for 30×50 ml gels.